Many buildings contain uninhabitable, mouldy and damp basement and cellars that have walls, with no waterproofing protection. The walls often form the foundation of the building, and are as such typically underground, beneath the waterproof membrane layer that serves as the buildings damp proof course. It is because of this the walls are constantly subject to penetrating dampness and water ingress. 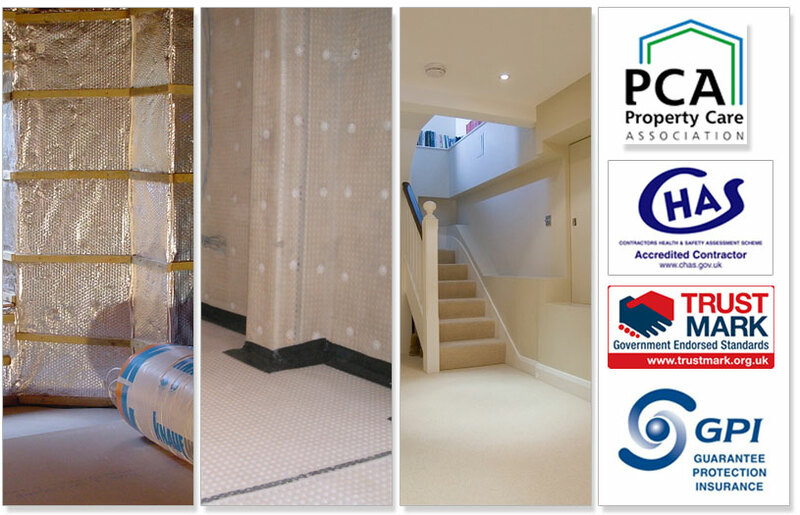 In order to waterproof underground structures and convert them into habitable and functional basement accommodation it is necessary to provide a fully sealed basement waterproofing or tanking system to ensure the moisture in the walls and floors is not permitted to migrate to the internal wall surfaces. Cavity Drain Tanking Membrane Robust dimpled waterproofing membranes that can be applied to almost all underground building structures that are affected by penetrating damp or water ingress. The impervious studded membrane creates continuous air cavities to permit ample water drainage and air circulation, allowing underlying substrate to both drain and breath. Fully sealed waterproof basement membranes enable water ingress management via the provision of sump and pump systems to ensure water is channelled, drained and discharged from the building. Structural Waterproofing This is multi-coat, pore-blocking slurry mix that is sandwiched between two coats of dense cement render. The tanking slurry contains polymers designed to enhance adhesion to the wall and increase tensile strength. Once applied the tanking is able to withstand external water pressure and maintain a dry environment by creating a physical barrier to water entering the basement area through the walls. At South West Wall Coatings we have completed many project using the methods described above, the process starts with a survey of the basement or cellar space that you are considering having tanked. Once the survey has been completed we will be able to offer the most cost effective and most efficient method of tanking to be used.